Thinking about this question, I wanted to look at historical data. 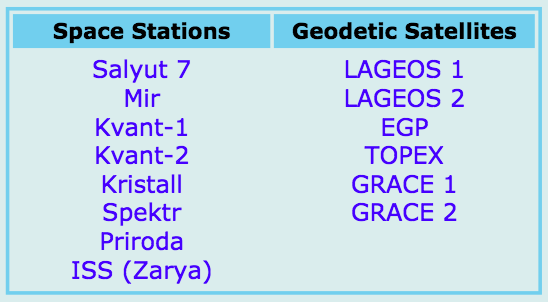 Then I noticed that while Celestrak does provide Archived TLE data for Salyut 7, Mir, Kvant-1, Kvant-2, Kristallm, Spektr, Priroda, and ISS (Zarya), it does not provide data for the recent Tiangong-1 and Tiangong-2 stations, nor for Skylab which was in orbit from 1973 to 1979. I'm wondering if there are any governing international agreements, policies, courtesies or considerations involved, or if this is just random happenstance. edit: For this particular question which has remained unanswered for a month, I'll be interested in thoughtful speculation, if that's what it takes to address this. @RussellBorogove's comment is fairly conclusive. ...I note that Celestrak was established in 1985, at which point Salyut 7 was up, but Skylab was not. The Archived TLE data page says 1980-2004, but there's a link to request earlier data. Skylab reentered the atmosphere before 1980 and Tiangong-1 and Tiangong-2 were both launched after 2004. And, as also pointed out there; data for them can be obtained by Celestrak's special request feature. Not the answer you're looking for? Browse other questions tagged two-line-elements tiangong-1 skylab tiangong-2 celestrak or ask your own question. Are 'classical' gravity turns still used and recognizable as such? Why did the Chinese put the Tiangong-2 so high? Why was Skylab allowed to fall, instead of being pushed into a higher orbit and preserved for the future? Why did the frequency of TLEs for the Hubble Space Telescope drop by a factor of 3 in 2009? “Deep space” corrections in SGP4; how does it account for the Sun's and Moon's gravity?